Rainbow Beach has much to offer to its visitors who are passing through or spending some time in the town. It is a great place for those who like to enjoy outdoor fun, and has beautiful weather throughout the year. Rainbow Beach is good for fishing, horseback riding, skydiving, kayaking and scuba diving, as well as many other fun activities. It's also known for its shops and restaurants, making Rainbow Beach a holiday destination for visitors from all over. It is perhaps best known for being one of the main launch points to reach Fraser Island. Is it often visited when people are passing through on their way to or from the island, with visitors often spending several days in the small tourist town to enjoy its many offerings. It's certainly known for being a great place to stop and enjoy a few days of relaxation before tackling the adventures of Fraser Island! 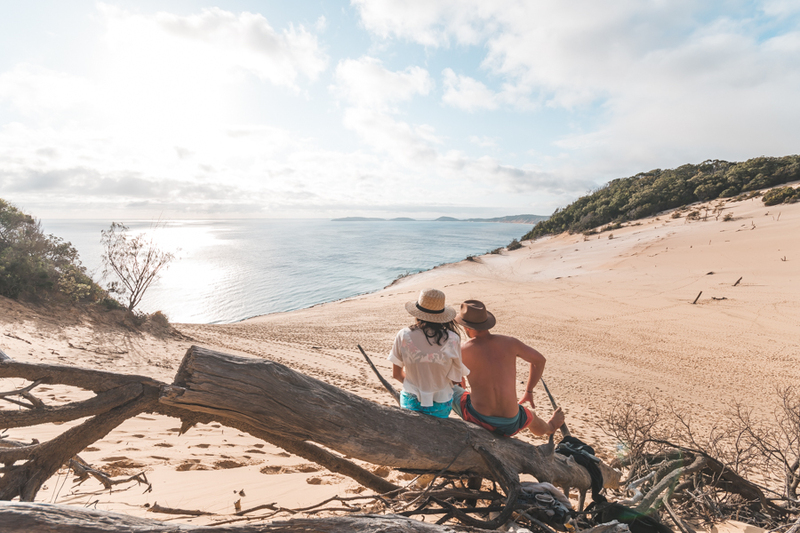 To get to Fraser Island from Rainbow Beach, visitors can drive to Inskip Peninsula to take a barge across the small channel, which will bring you to most southern point of the island. Inskip Peninsula is about 14 kilometres from Rainbow Beach, so only take a few minutes by car. Visitors either opt to drive their own 4WD vehicle or join a tour of Fraser Island, which either offers a guided tour or the use of a vehicle in a tag-along tour. If visitors are joining a tour, they can arrange a pickup or meeting point in Rainbow Beach before making their way to the island itself with their tour of choice. This is the best option if you are travelling without a 4WD vehicle but still want the whole Fraser experience!